Wow leapt into pow with Indianapolis Ballet’s New Works Showcase, Nov. 8-11 on the Christel DeHaan MainStage at The District Theatre in the heart of Indianapolis’ Mass Ave Arts District. 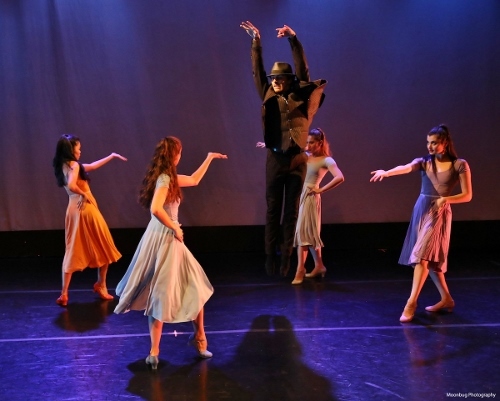 In the performance on November 8, Joshua Burgasse’s sizzling "Aspects of Andy" was at the fulcrum of a showcase of Ballroom, Blues, Broadway, story and abstract ballet. In this gutsy program, narrative does not exclude playing with abstraction, nor does a visionary notion exclude a plot. In a form where the art is created on the bodies of dancers, and the dancers in sync with music and movement layer dimension through their distinct personality and intellect, everyone in the audience is free to absorb meaning and matter on their own level. Good dancing is good dancing no matter how it’s categorized. An aura of floating above the floor was the cohesive element connecting the five works on the program which, as far as I could discern, were developed independently of each other. Artistic Director Victoria Lyras simply tasked three resident choreographers [including herself] to create a piece. On reflection, the morning after, I am ruminating on this symbiosis as an element of what is marking Indianapolis Ballet as a company that delights in glyphing off the strengths of guest choreographers to show off their own strengths. Indeed, it starts with plumbing the extension of love’s meaning from the opening segment Paul Vitale's "Take it from Tony." Sierra Levin, Jessica Miller, Mary Ann Schaefer - on pointe, and Shea Johnson, Kris Santos and Aaron Sternberg all played with Tony Bennett’s velvety intoning in lyrics such as “There’s so much more embracing/Still to be done but time is racing/Oh well, we’ll catch up some other time…Let’s just be glad for what we had…” Then extending from Leonard Bernstein into Cole Porter’s "Dream Dancing" lyrics, “When shades enfold/the sunset’s gold…” and "living again with loss…this is a ballet loaded with thoughtfulness." Wow on what transpired between these couples living inside the Great American Songbook, playing out their stories within the lyricism of ballroom dancing. Next, choreographer Roberta Wong masterfully swooped and soared into Rob Dixon’s "Flat Tire Blues," and Rowan Allegra and Glen Kelich, in a smooth-as-silk playful interchange, perfectly matched the wink-wink/nod-nod banter between drummer Mike Clark’s Texas shuffle and Dixon’s yeah, yeah, uh-huh counter-reply. Sprightly, take-your-breath-away derring-do where music and movement totally merge. A "Whoa" from an audience member releases all of us to breathe—and applaud. "Aspects of Andy" is a mini-musical, a complete story on a street in the city that never sleeps, where events repeat themselves in slightly different configurations and who gains the upper hand is up for grabs. Chris Lingner, as Andy, dukes it out with a throng of 'Thugs' and 'Ladies' while his wily assistant Camila Ferrera makes off like a bandit. Beware of the red scarf. Also of note were the moxey moves of dancers Gregory Guesser, Glenn Kelich, Leonard Perez, Sternberg, Levin, Miller, Abigail-Rose Crowell and Katherine Sawicki. A brief intermission separates Linger from wearing a multi-layered zoot suit and fedora [Aspects of Andy], to being clad in a gold-hued short chiton with an olive wreath wrapped around his head. Though originally choreographed in 1935 by Agrippina Vaganova, to music by Cesare Pugni, the staging here semi-qualifies as a "new work" that takes a different turn from the original Petipa ballet based on Ovid’s re-telling of the Diana & Actaeon legend. While Vaganova’s bravura pas de deux for Diana and Actaeon features spectacular "stag leaps" for "Actaeon" [as a nod to the original Roman myth] this divertissement is a tender love-story, not a sad tale of happenstance that turns a hunter into a stag. Yoshiko Kamikusa and Linger amaze technically and emotionally. It’s total joy to witness, abetted by costumes by Kamikusa. With "Caprice & Variations," to music by Nicolo Paganini and Witold Lutoslawski, Victoria Lyras takes us into the dimension of personified waves. While costuming throughout is satisfying for each piece, it reaches near perfection with dancers in skintight glistening azure blue body suits, its the swag of ruffle riffing throughout the constant movement of uplift and plunge, froth and descent that earns a nod to costume designer Loukia Finale. Kristin Toner and Shea Johnson create stunning moments, layered upon and amplified by the full company in swelling energy. It’s the constancy of kaleidoscopic configurations that bedazzle, underscoring the power of water as relentless. Special mention to Michael Drury for outstanding sound/lighting. 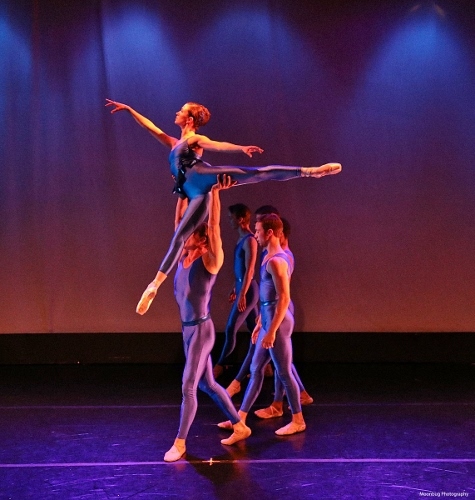 This program re-emphasizes why this young company of 20 dancers earns accolades on all levels. (L to R) Abigail Bixler, Jessica Miller, Riley Horton, Rowan Allegra & Sierra Levin performing Aspects of Andy, featuring the choreography of Joshua Bergasse, during Indianapolis Ballet’s "New Works Showcase". Yoshiko Kamikusa and Christopher Lingner performing Diana & Actaeon, featuring choreography by Agrippina Vaganova, during Indianapolis Ballet’s "New Works Showcase". Shea Johnson helps Kristin Toner soar during Indianapolis Ballet’s premiere of "Caprice & Variations," choreographed by IB’s founding artistic director Victoria Lyras.